Latin Magic Symbolist artist Karlisima was born in San Salvador, El Salvador. 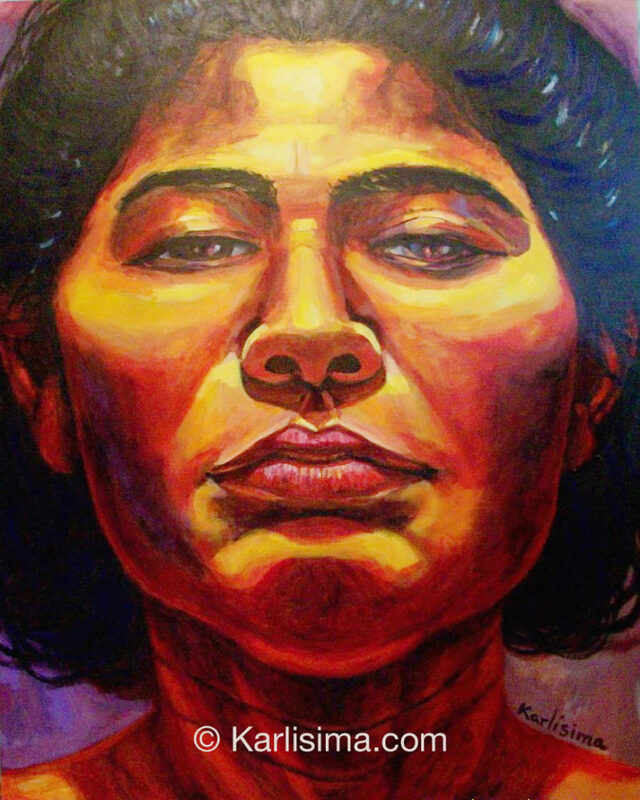 She took art classes with artist Jose Mejia Vides and artist Armando Solis in San Salvador at the age of seven thanks to her mother, who recognized her gift in art. She came to the United States to be reunited with her mother in 1984, at the age of 14. Karlisima attended TC Williams High School and later graduated with the Art Student of the Year Award from Annandale High School in Virginia, in 1988. She studied painting at Washington University in St. Louis, Missouri, from 1988 to 1992. She received a scholarship to study French and art in Tours, France, during the summer of 1989. She became fluent in French and studied German and Italian at Washington University, discovering a passion for languages which complemented her love for art. At Washington University, she studied art with Professors William Hawk, James McGarrell, Barry Schactman, William Kohn and Betsy Morris, among others. She also received the legacy of the German Expressionist Max Beckmann who was an art professor at the University from 1947 to 1950, and who had greatly influenced the art department. She graduated from Washington University as a Painting major with a Bachelor of Fine Arts Degree in 1992. In August and September of that year, she visited New York and the Pratt Institute, but returned to Washington, DC, to teach art to children and youth. In 1995, Karlisima worked at the National Gallery of Art as a silkscreen specialist and graphic artist, and in 1996 as a silkscreen specialist at the Smithsonian National Museum of African Art. In 2002, she assisted artist Anne Marchand to paint a 34 x 34 foot large mural entitled ” Community,” which is located at the Westminster Playground at T and Westminster Street NW by the U Street Cardozo Metro in Washington D.C. Later that year, she traveled to Ottawa, Illinois to assist G. Byron Peck to paint a 60 x 40 foot large mural entitled “The General Wallace Mural” to commemorate the Civil War Hero. In 2003, Karlisima traveled to Mexico to paint a mural with Anne Marchand and 11 Mexican Muralists in Culiacan, Sinaloa, (The Pacific Coast of Mexico), as a part of an artist residency to build friendships and good relations with the Mexican Muralists, thanks to a grant from the D.C. Commission on the Arts and Humanities. In 2004, Karlisima painted a Panda Bear Sculpture entitled “ My Mayan Land” as part of DC’s Pandamania Project, and which was purchased by a private collector. 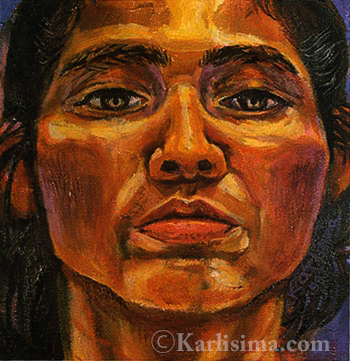 In 2005 and 2006, Karlisima traveled to England and Germany to exhibit her paintings and to do what she called her “European Art Tour.” She exhibited at the “Praxis Cultural Centre” in London, and at the Paracas Restaurant-Art Gallery and the Salvadoran Embassy in Berlin. In 2008, Karlisima won a PABC grant (Public Art Building Communities) from the DC Commission of the Arts and Humanities to paint a 60×25 foot large outdoor mural entitled “The Mama Ayesha’s Presidential Mural,” located at the Mama Ayesha’s Restaurant at 1967 Calvert Street NW, Washington DC., by the Woodley Park Zoo and the Duke Ellington Bridge. The mural depicts 11 US Presidents from Dwight Eisenhower to Barack Obama, the White House, the Lincoln and Jefferson Memorials, the Washington Monument and the Capitol. The mural received world-wide recognition and was called “DC’s Biggest Postcard on a Wall” by the City Paper and was voted “Best Mural Runner-up.” In addition, it was featured on CNN, WETA, Fox News, MSNBC, NBC, Channel 4, 9, MTV, the Washington Post and the New York Times. This mural appears on Wikipedia and in history textbooks in Norway. Karlisima inaugurated the mural in 2012, and dedicated it to President Obama for being the first African American President in US history. In 2009, she painted the Highland’s Mural at Highland’s Café at 4706 14thStreet NW and in 210, she painted the Potter’s House mural entitled “The Light of the World”, at 1658 Columbia Road NW, Adams Morgan, and which was painted over by the new Potter’s House management in 2014, despite Karlisima’s attempt to save it. One of her mentors and good friend is the great and famous artist Sam Gilliam, whom she met several years ago, thanks to her good friend and colleague, the talented artist Angel Perez. Now Karlisima is thankful to her teachers. She is also thankful to her friend and mentor, the outstanding artist Anne Marchand, who has guided Karlisima and shared her knowledge with her with great generosity. 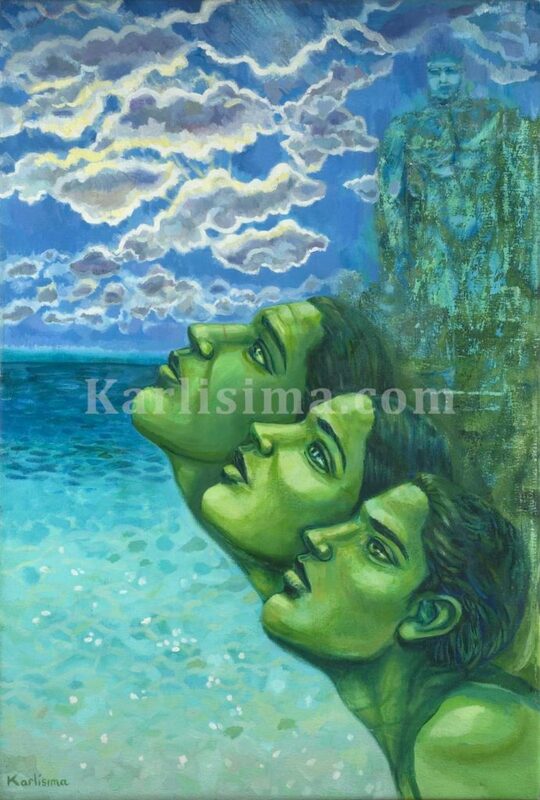 Karlisima’s art is classified as “Magic Latin Symbolism” because her paintings resemble that of the Symbolist movement and the Latin surrealist art of Frida Kahlo, whom she greatly admires. Her art combines elements of the visible and invisible plane, as she creates an imaginary world from her fantasy, with its roots from her Mayan ancestry and culture. Her symbolism is based on symbols of Mother Nature and the magic realism of Latin America, influenced by the Mayan shamans, her ancestors. She depicts faces gazing upwards, looking and glancing upward, looking to the light, looking to the IDEAL…symbolizing the evolution of the soul and the quest for enlightenment, different stages of consciousness or conscious awareness and the unfolding process of the soul. The color green in some of these faces is symbolic of green grass, green fields, green leaves, green trees, green fruits and vegetables, and the green in Mother Nature. That green is a symbol of the prosperity of the Universe and the “Hope,” the hope of something better than what “appears” right now in front of our eyes. This is the hope that she tries to transmit in her paintings. See the painting “Hope” below. Title: “Universal Oneness,” 12′ x 52″, oil on wood. Collection of the Artist. Painting for sale. Inquiries by Email. In addition, she has been dramatically influenced by the vibrant color and energy of the paintings of Vincent Van Gogh and the brushstrokes and harmony of color in the structured and constructed paintings of Paul Cezanne. Other artists that she has admired throughout her life are Odilon Redon, Paul Gauguin, Claude Monet, Pierre-Auguste Renoir, and Georges Seurat, especially because of their impressionistic and pointillistic brushstrokes, as she also uses short, bold and thick brushstrokes herself, evidenced in her painting series entitled “Lord” and “Lord, The Garden of Eden. (See below). This painting depicts a solitary figure in a peaceful forest which is a symbol of what she calls “a Place of Peace,” and a metaphor for the inner peace that can be found within each person’s soul. So, this forest is not an actual place, but an ideal place, and that is why she uses symbols to describe states of mind or feelings. In this case she is aiming to depict the feeling of peace and serenity. 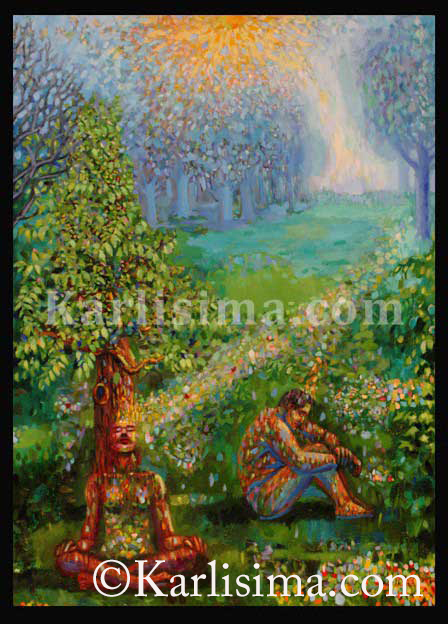 Title: “Lord, The Garden of Eden,” 30″x40″, Oil on Canvas, Collection of the Artist. Painting for sale. Inquiries by Email. Title: “Lord II,” 30″x40″, oil on canvas, Collection of the Artist. Painting for sale. Inquiries by Email. 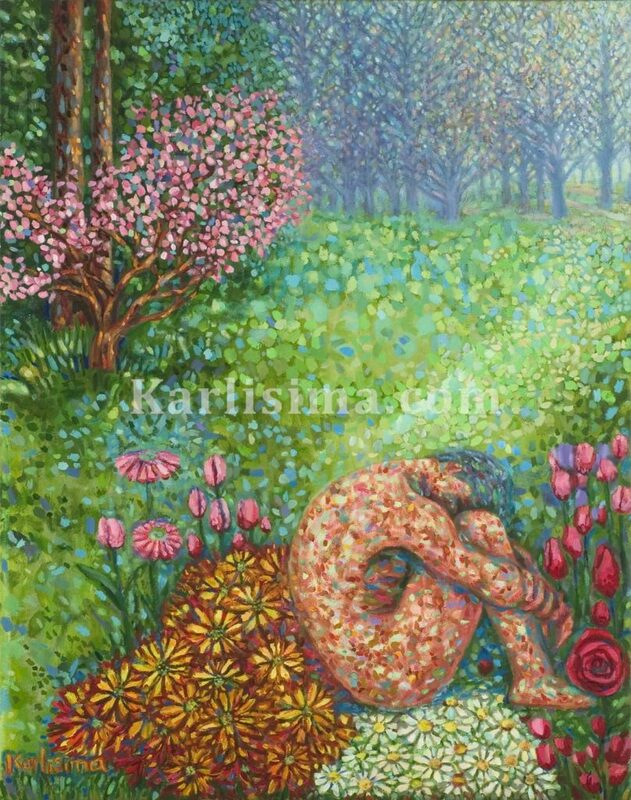 Karlisima’s symbolist art is inspired by her spirituality, her devotion, her dreams, visions and imagination. Her desire is to express the Ideal. Her art is filled with symbols of Mother Nature, the Mayan culture and her experiences as a child growing up in El Salvador. As she expresses the Ideal and the Eternal Ideas, which she learned from Leonardo Da Vinci and Michelangelo, she believes that she is being true to herself, for she believes that the Ideal is the Real. She paints primarily in oil and her colorful paintings resemble the brilliant color of mosaics, stained-glass windows and the sacred illuminated manuscripts of ancient world religions, which became her fascination since she was a student at Washington University. 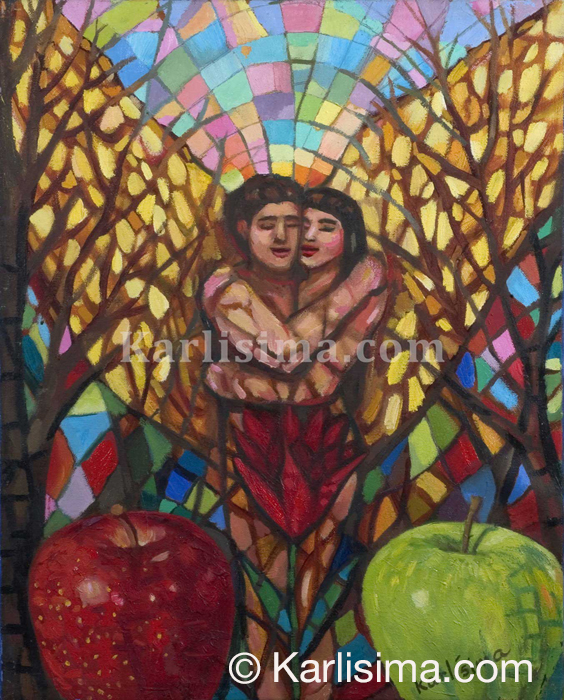 Later, her fascination for stained-glass windows grew, as she visited Notre Dame, Chartres Cathedral in France and the National Cathedral in D.C. She began using geometric shapes and fragmentation in the paintings to mimic the fragmentation of stained-glass windows, as is evident in her painting called “Adam and Eve.” (See below). Adam and Eve. 16″x20″, Oil on canvas. Collection of the Artist. Painting for Sale. Inquiries by Email. She has been painting, making murals and teaching art to children and seniors in Washington, D.C., since 1992. She realized that her destiny was to come back “home” to D.C. and make her art career in the District of Columbia, the Nation’s capital, and not in New York. Title: “The Vision- Self-Portrait” (12″ x 12′, Oil on canvas). Part of “Women of The World – A Global Collection of Art ” Exhibition. Private Collection. Since 1997, Karlisima holds a copyist permit which allows her to make copies of the masterpieces at the National Gallery of Art in Washington D.C. She copies there at the museum regularly, once a week. She is extremely thankful for having lived in Washington D.C. for more than twenty-five years and for the many opportunities she has received in her life. In addition, she is extremely thankful to LIFE, her mother and father, her siblings, her husband and family for giving her opportunities to grow, mature, paint and to dedicate her life to painting. She wants to give back to humanity by making art that inspires, heals and dignifies the minds and hearts of all people, and bring a message of joy, hope, optimism, courage, forgiveness, peace and unconditional love. She wants everyone to know that we are not alone, and that we are one, one people, one unity, all brothers and sisters. © 2019 Karlisima. All Rights Reserved.